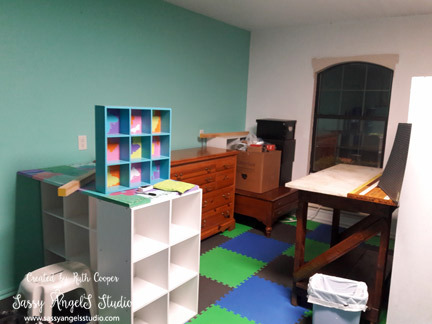 Studio Makeover Part 2 – Welcome! It’s been a busy week trying to get the studio into somewhat of a workable state. The texture & flat paint on the walls and ceiling made 3 coats of paint necessary for the white paint & only 2/3rd’s of the painting is complete. Today we got the floor in & started to arrange furniture. It will be bare bones but I can host Angel Club this Monday, Yay! Here is the beginning of figuring out the pattern. There is a story to the flooring. When we thought we were going to get the 1st home we offered on, the studio space was going to be smaller. So I figured I would keep the walls white. 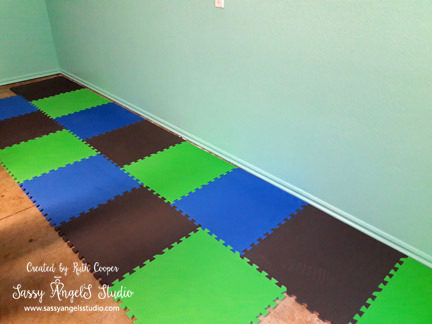 Hubby suggested colored tiles for the flooring to add some interest so I ordered the blue & green tiles on sale planning to checkerboard the floor. Then the offer fell through on the house and I still had blue & green tiles. Then we got this house & a bigger studio space. Somewhere in all my research I fell in love with the Teal color for the accent wall not even thinking about having primary blue & green tiles for the floor. It dawned on me about a week ago that they weren’t going to match. So since I needed more tiles to complete the bigger space, I ordered gray tiles to soften the impact of the blue/green. Don’t think it worked all too well but it’s definitely colorful. 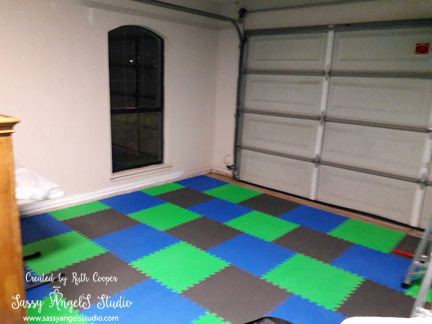 We went with foam tiles because it is a garage floor, they are mold/mildew resistant in case there is any water issues, they are easy to clean & easy to replace if for some reason a couple get damaged. Very nice to walk on so far. I don’t have full pictures for impact yet but this was the last corner of the completed floor. We also removed the old, icky blinds revealing the nice arch of the windows. This is the final wall that needs painted as well as the ceiling above it. Do to space considerations, this wall will also hold the paper cabinets between the 2 windows instead of the opposite wall as originally planned. The brown cabinet at the edge of the photo is my 12 x 12 paper cabinet. We still needed space for the small freezer & whole house filtration system so I had to move my work area down the back wall a bit. Trying to utilize the space as well as possible isn’t as easy as you’d think. This is a trial placement along with some items that still need homes until the painting is finished. You can see where we removed the blinds on this window & I still need to paint where they were. It’s going to be a nice space once I figure everything out, the guys help with a few more things like more lighting & electrical & we finally decide on the garage door/separate entrance. The available wall space to hang/display things will take some thought. I have 2 inkpad units on order, & quite a few other things to figure out. It may or may not be good news that we are going to Dallas to visit IKEA this week. I could get into more trouble & have to figure out more organization. Stay tuned for additional updates & a final tour as it nears completion. Wow, it’s really looking good! I can’t wait to see it Monday!